If you’re looking for a highly affordable DIY greenhouse idea that can be constructed quickly, all you need is some PVC pipe and sheets of polyethylene. Start by taking lengths of ¾-inch PVC piping and set one end in cement or wood blocks at even intervals (at least 12 inches but no more than 24). Bend the pipes in a horseshoe shape and set the other end in wood or cement to create a hoop framework. From there, simply cover the hoop with polyethylene or plastic and enclose the ends. If you have an abundance of old windows on hand or access to home renovation scraps, you can turn them into a quirky little greenhouse. Simply stack the windows on top of each other, end on end, to create the walls of your greenhouse and seal the corners and joints with caulk. By the end, you’ll have a sturdy little greenhouse that you can paint or stain as you like. If you have an old trampoline your kids have grown tired of, don’t fret about how to get rid of it – turn it into a DIY greenhouse! All you have to do is remove the springs and cut the large metal frame into two half-circles. Drive the ends of each half-circle into the ground as the framework for your greenhouse then stretch plastic sheeting between them to enclose the greenhouse. When you have no need for a large standalone greenhouse, but you want to protect a few of your plants during the cold winter months, you might just need a cold frame. Start by constructing a simple box out of plywood then create a frame for the top. Cover the frame with plexiglass, add hinges on one side and a handle on the other, and you’re done! 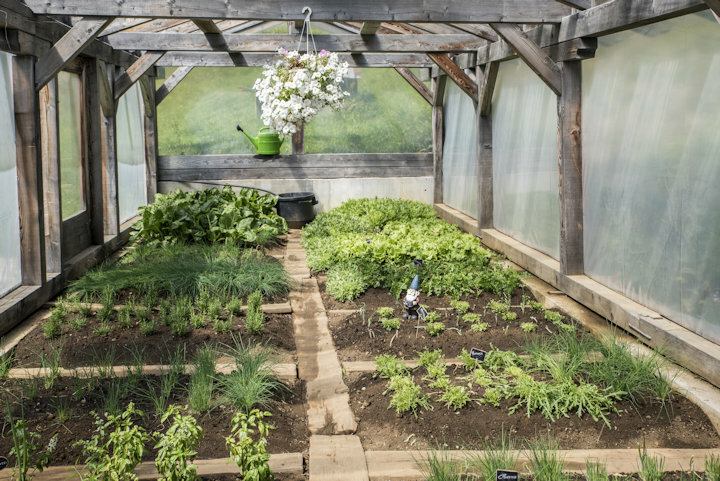 Place the cold frame over the plants you want to protect and you’re good to go. If you don’t need a large greenhouse, all you need are some wood scraps or old windows. Start by building a simple square or rectangular frame then install shelves on the inside to hold your plants. Cover the outside of the frame with plexiglass or the glass from your old windows, and you’re done! From there you can paint or stain the greenhouse and place it right on your deck. If you live in an area that doesn’t get too terribly cold, but you still want to protect a few of your plants, a simple umbrella greenhouse may be the way to go. Simply find a plastic umbrella that opens to the size of your potter and remove the handle. Drive the pole of the umbrella into the soil in the middle of your pot and push it down until the edges of the umbrella overlap the sides of the potter. It’s that easy!